There has been quite a bit of historical fiction on the book shelves lately. I find that there are two types of historical fiction. First there is the really good stuff, where the author has done great research and takes the time to make sure the minutiae is correct. The other is where an author sets his or her modern characters in an historic time where they stick out like sore thumbs. Devin Murphy’s debut novel, The Boat Runner, is one from the first category. We’ve read novels set around World War II from the American, English, German, and Jewish points of view. Rarely have we seen the way a neutral nation, like The Netherlands, lived through German invasion and overhead Allied and Axis bombers. Where will loyalties lie? Will you said with the invading force, or will you become part of the Resistance? It is 1939 and Jacob Koopman is fourteen years old and mostly unaware of the political seriousness out of Germany. With his artistic brother, Edwin, they go about daily life while his parents and uncle keep a wary eye on HItler’s advance. Mr. Koopman runs a lightbulb factory and is hoping that a contract with Volkswagen will keep him in business despite a looming war. When the Germans invade, life is turned upside down for Koopman and his family. His father loses control of his factory and must go into hiding for sabotaging his own lines. His mother and best friends must work in the factory to make up for his father’s disappearance. Meanwhile, his uncle is leading a local resistance outfit behind the protection of a Nazi uniform. After Allied bombs fall on his town, destroying life as he knows it, he decides to join the Germans as a way to retaliate against the deaths of his friends and family. Simply going about his life in the army, he becomes a reluctant hero for the Germans. Over four years, we see Koopman struggle with the decisions he’s faced with as the war comes right to his doorstep. Each decision he makes sends him down paths that test his morality. At some point, he lust make redemption for those choices. That is this story. I absolutely love character driven novels, especially when the characters are so richly written.Jacob Koopman is the main character of the book. The other characters are more like set pieces against which Koopman reacts. He reacts beautifully. Murphy has written a life-like character that the readers will feel real empathy for. Devin Murphy gives the readers a slice of World War II from a distant point of view, yet not so distant that the characters were affected by the looming spectre of the conflict. Each facet of the war, as it affects their lives to greater degrees, engages the characters in new ways. How Murphy has Koopman follow each choice is in interesting study of humanity. I cannot stress enough how much the character of Jacob seemed so real. Parts of this book read like an autobiography from Jacob’s point of view. It is a fascinating read. 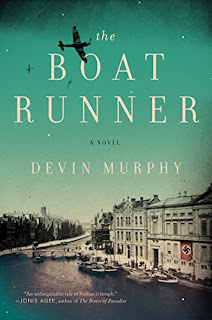 As I said earlier, this is Devin Murphy’s first novel. This is a great first work. The history was real. The character of Jacob Koopman was very real. Add to that, the fact that Murphy is kind of local, and it’s a win all the way around. According to his bio, he grew up near Buffalo, and attended St. Bonaventure University. I think it is always wonderful when local talent showcases their amazing abilities. Craig Bacon hopes someday he will have a book on Amazon for everyone to read. He’s working on it. All the time. Daily. For real.